On 11th August 2010 Lady Antebellum played their debut UK gig to a sold out Shepherd's Bush to support the UK release of their second album Need You Now. They returned to the UK last week after their third album, Own The Night was released in the UK on Monday 3rd October. The band had tv appearances on both The Alan Titchmarsh Show and BBC Breakfast as well as playing an exclusive show for BBC Radio 2 In Concert at the BBC Radio Theatre and for Love Live Music at The Penthouse. 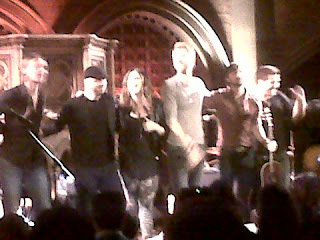 These gigs were both competitions to win tickets but Lady Antebellum also played a sold out gig at Union Chapel on Friday 7th October. 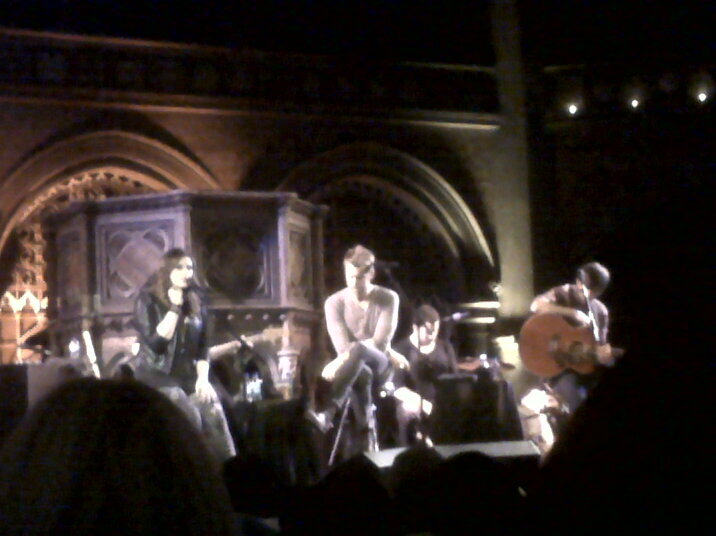 Union Chapel has seen many country music acts in it's past, including both Court Yard Hounds and Laura Cantrell and it appears that country music has been very well received there, something that perhaps prompted Lady Antebellum's record label EMI to chose the venue for their gig. 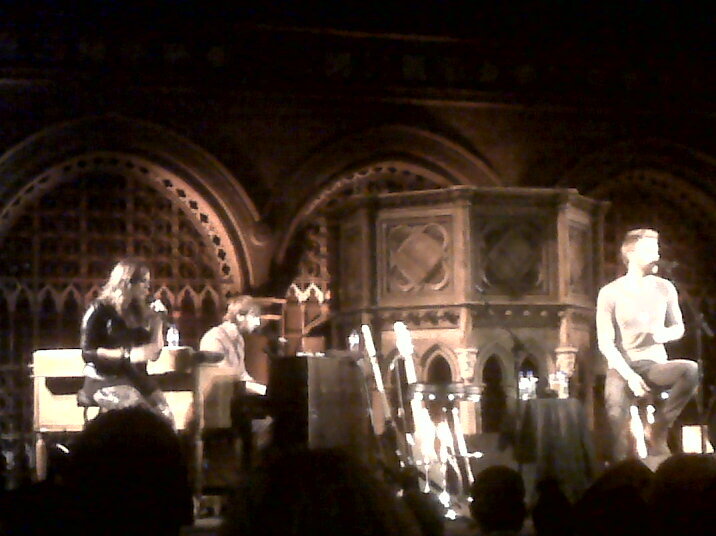 The gig was advertised as Own The Night: Unplugged giving fans the impression of a stripped back, intimate gig which made Union Chapel a very good location. Charles Kennedy addressed some of the concerns and confusion over the venue that had been voiced on various websites by stressing the band's desire to play an intimate and relaxed gig and hinting that the band may bring their soon to begin US arena tour over to the UK next year. I would however mention the lack of obvious heating in the venue. 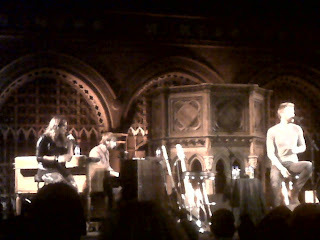 The chapel warmed up during the gig but many people sat with coats and scarves on for a long time. Doors opened at 7pm and Lady Antebellum promptly took the stage at 8pm, launching into the hit single off their new album We Owned The Night, an up-beat song with a strong drum beat behind it. While the album has it's fair share of up-beat, gutsy songs it also has more mellow songs and Lady Antebellum performed a lot of these during the gig. A favourite with the audience was As You Turn Away, a powerful song about the final moments of a failed relationship with a Hillary Scott lead. They closed the set with Just A Kiss, a song that had already charted well for them as a single in the UK. The harmonies throughout the gig were flawless and well supported by their four piece band. Own The Night as a whole really shows how Lady Antebellum have developed as songwriters and artists. It is a very strong album with a good mix of songs. In interviews, Lady Antebellum tell how they took a lot more time out to work on Own The Night than they have on previous albums, something that the music has certainly benefited from and while the album still has the typical Lady Antebellum sound it also sounds more developed. As well as playing songs from their album, Lady Antebellum also played hits from their previous two albums, including Lookin' For A Good Time and I Run To You. They also used their encore to finish the night with Need You Now to huge applause from the assembled audience. Lady Antebellum had the crowd on their feet a lot as the set neared it's close and they reached the more well-known, faster tempo songs. Most of the audience were singing along to most, if not all, of the songs and were on their feet on many occasions. Lady Antebellum were very relaxed during the gig and were laughing and joking along with the crowd and talking about the messages behind many of their songs. As of 08/10 Own The Night was charting at #4 in the UK charts (higher than their last album Need You Now) a very impressive spot for country music in the UK and shows just quite how large in number and dedicated the UK fans of Lady Antebellum are. A definite five stars from me for a brilliant night. Roll on next time!